Whether it's sheer luck that you’ve stumbled across this page or you know great style and just had to click here, this purple sheer ribbon will be your gift wrapping best friend. When you're in need of a pick me up for your gift wrapping and the wrapping paper just isn't doing it for you, tie your box or bag up with our purple ribbon! This way your gift will always shine bright. Just be sure to thank it later! Be able to accessorize gift wrappings, crafts, projects and more with this standout ribbon. The purple color goes great with many colors, from navy blue to hot pink. With this ribbon, your gift giving will automatically be top notch, especially with the shine that comes along with the ribbon! 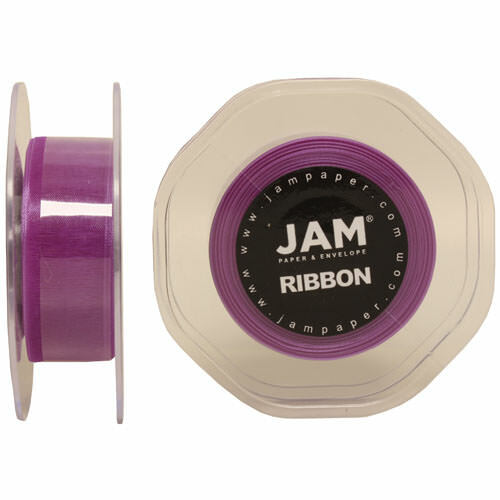 Purple Sheer Ribbon is 7/8 inches wide and available in a 25 yard spools. Sheer ribbon is long lasting and high quality, so your gifts will never be ignored.